Quick thought. It would be very useful to be able to have more than one sensor panel. ie, indefinite number (within reason ofcourse) independent of each other. I believe Aida64 users should be able to place any object anywhere on the available desktop. Set a clock (with predefined templates) here, set a graph there and place some bars or values elsewhere. Don't get me wrong, I love SensorPanel and it auto-loads on my system, but it feels limited and restrictive. My sense is that Aida64 is geared toward Geeks, Overclocking Gamers and System Admins at the moment. If the frontend (SensorPanel) was made more flexible with presets, templates and various eye-candies, Aida64's overall market share for this genre of programs would grow greatly. I love Aida64 and I adore the developers and their responsiveness. These comments are from the heart, and intended to continue the discussion. I should also be able to right click on a displayed object and be taken directly to a window that allows me to change settings for that object. I know, this is full blown programing toward the front end, but that's exactly what I am talking about. Dont understand what *Looks for a 'Like' button to click* means. I agree with you whole heartedly. Being able to drag & multi select sensor panel items around the entirity of the desktop would be great, along with transparent background. Was a reference to the Facebook Thumbs-Up Like Button seen often, meaning I agreed. Looking forward to it. Thanks v much for the update. It's nice to see community driven (I think it's forum driven, maybe not) improvements in an already great piece of software. Dug a bit from the past, but the official response appears an enthusiastic YES... is this still forthcoming? I totally get that Fiery, AID as it stands now is an outstanding tool and as much everyone loves to see improvements, I'm sure patience wins out here. i was wondering if there is a way to round the edges on the graphs a bit. An option for that anyway. I like big graphs and I wonder sometimes how they would look with softer corners. Due to the overlapping (overlaying) visual elements, making a soft/rounded corner would be quite difficult to achieve, and would make the rendering much slower than now. Yes, it is a shame, and sad. I remember when SensorPanel was first released... all the excitement and camaraderie... users posting their SensorPanels... developers implementing and updating user requests/comments almost instantly. I don't remember precisely when the decision to abandon SensorPanel development was implemented, but it seems it was not too long after FinalWire came on the scene. And FinalWire is a business, which requires a return on investment, so it makes sense from their point of view. To be honest, the SensorPanel probably requires a complete rewrite or at least recompilation with software that can do graphics to a more competent level... real gauges, transparency, etc.. I still use Aida64, just not the sensor panel anymore. It will always have a spot in my good-times memories though. Well, it's not like you cannot do nice things with SenorPanel. I really like AIDA for what it is, of course you can always improve it, but it's not like they're not committed to the tool. Especially since it really is just a niche market. I agree with all you say... AIDA 64 is a great tool, and as I said, I happily use it to monitor my system, and feed data to my status display software via WMI. 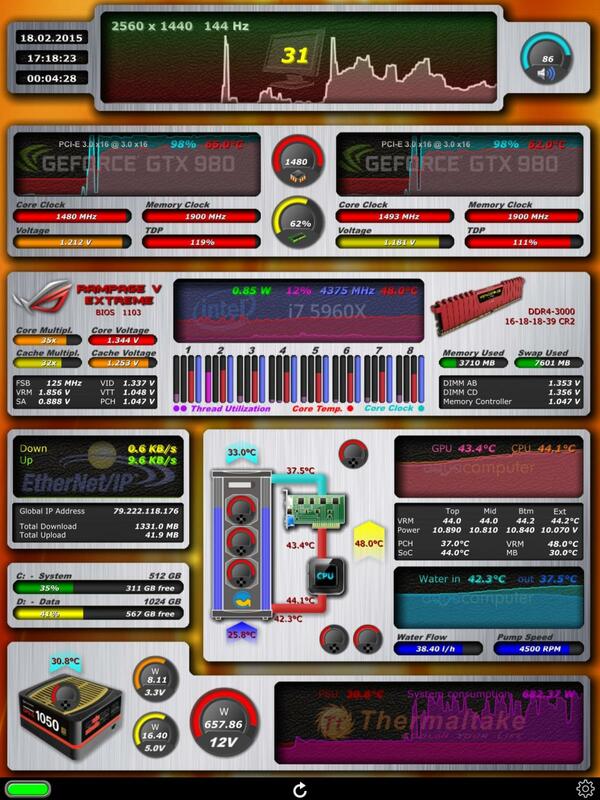 In the clip below of my 2nd monitor, all top gauges are fed by AIDA 64 (just started the layout). Yes, with the picture placement function you can do a lot with SensorPanel to manually paint a background, upon which you place simple objects. But SensorPanel is still quite limited in its graphics capability, particularly graphing function and transparency. I believe the SensorPanel was originally envisioned as a more flexible/powerful gadget replacement tool, not a full featured graphical display. And it looks as FinalWire has decided to not develop the tool beyond it's current capability. It probably makes good business sense, and I accept it for what it is. I'm afraid your memory is not quite correct about the SensorPanel's history First of all, it was unveiled in June 2011, roughly 7 months after FinalWire came on the scene and we've introduced AIDA64 v1.00. So it was never a project tied to the previous generation of software (Everest). Another slight correction: both AIDA64 and Everest are commercial products, so the business sense, our approach hasn't changed due to that switch back in 2010 at all. All our software are there to satisfy user's needs, but in exchange we need a bit of financial compensation to keep things going forward. I'm not here to complain, but we have to allocate considerable resources to keep the quality and dependability of AIDA64 on the level that our faithful users got used to. As for the SensorPanel, we've never promised or planned to implement such features like transparency or a full-blown rendering engine. If we would want to do such things, we may be better off moving the whole thing under Direct3D or OpenGL anyway, but then people would complain about the impact of the rendering engine on battery performance and CPU power saving features. We have to (and want to) cater for everyone: AIDA64 has to be easy to use so less-experienced users can understand it and perform certain tasks with it; but it also has to offer unique tools and sometimes very specialized and rather compelx features to satisfy the needs of users who are blessed with a deep knowledge about computer matters. I admit, sometimes it's tough to find the balance between those very different expectations, but the fact that we're on this scene and keep doing basically the same thing for 20 years now proves that we must be doing something right Not perfect, of course, but most things in life are not (and can not) be perfect. I'm so excited to see these new things that keep pace with emerging technologies. Mobile technology has always been a passion of mine. I'm very new to AID and would already love to see you guys continue to be very successful . (you can count on my renewal every year) My personal opinion with regards to tech is to look forward never back. A bit eccentric but everyone i know who is successful in the Tech industry never looks in the rearview. I would love to have more than one Sensor panel, and if its feasible I'll definitely make use of it. I would be happy being able to right click on the panel and choose between two different sensor panels. I believe swapping between 2, or more, SensorPanels is possible. All it requires is that you have 2, or more, SensorPanels saved to disk, with one being active.. Select another SensorPanel, and accept overwriting your existing panel settings. EDIT: Be sure the SensorPanel your are changing-out is saved to disk (exported) before over-writing it with the new one.